Imagine finding out your brother died in an accident. You have to return to the place you swore you’d never go back to. Then, when you muster up the strength to face your family at the visitation you find out the accident the police say happened doesn’t seem to match up with the facts. Instead, it appears your brother was murdered and now you feel that it is your job to get revenge. Ethan hasn’t looked back since he left Cedar Rapids, Iowa, and went to grad school in Arizona. There were a few phone calls home to his brother, Aiden, but mostly he left the horrible memories of his life there in the past. Returning home brings up all kinds of flashbacks and pain from Ethan’s childhood and new revelations about the life Aiden was living. Ethan’s deep grief, shock, and remorse over the loss of his brother oozes off the page. He tries to grasp first that he died so young in an accident and then at the visitation is told that maybe this wasn’t an accident at all. Prochaska expertly writes for a first-time novelist, the pain of seeing someone you love lying still in a casket. These paragraphs give readers a brutal look into the emotions of those left behind. Ethan’s feelings of disbelief and guilt fill the reader with sadness and yet encourage us to move through the pages as we hope that Ethan can find a peace with his past. Some may think the novel starts slow without much fanfare as the novel begins with Ethan returning home. Instead, I think it sets the reader up for a deeper understanding of Ethan’s need to face some hard truths about his past, his decisions, and the influence those choices had on the family he left behind. Prochaska takes readers through the hum of the city. Whether you are driving through neighborhoods or down 1st Avenue, you can imagine yourself riding along in the car with Ethan. 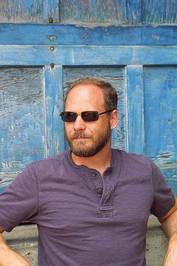 He methodically gives readers the lay of the land so there is no doubt about the type of place Ethan may find himself whether it is his father’s home, a local bar, or the shady motel he is staying in. Cedar Rapids is given a part in this novel that is just as important as any other side character that he introduced. VENGEANCE is less about finding out who killed Ethan’s brother and more about Ethan finding himself. Prochaska draws you in with the emotions in the beginning and takes you for a thrill ride through the middle as revenge takes over. The novel ends with the reader reflecting on their own relationships and the choices that were made in our own lives. Award-winning author Eric Prochaska has published short stories in dozens of magazines. 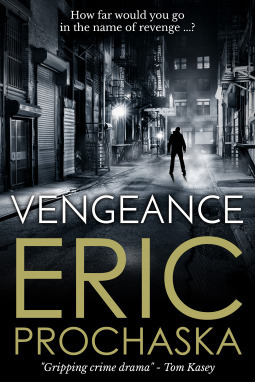 His debut novel VENGEANCE combines literary and populist elements into a unique noir-esque tale. Raised in Cedar Rapids, Iowa, he now lives in and explores the American West. Check out all of Prochaska’s books, click HERE. Eric Prochaska was a homebody, but on the weekends he spent most of his free time as a kid at the comic shop. He dreamed of being a comic book artist until Mrs. Bach, a teacher at McKinley Middle School, assigned her class to write a short story instead of a report. Mrs. Bach and another teacher gave him feedback and encouraged him in his writing. Mrs. Bach moved over to Washington when the Cedar Rapids School District restructured the grade levels and she continued to encourage Prochaska in his writing. He continued to write short stories and that, as they say, is history. Prochaska has written several short stories that have been published and has finally had his first novel published, VENGEANCE. VENGEANCE is loosely based on his life growing up in Cedar Rapids. In the novel, the main character, Ethan, loses his brother. Over twenty years ago, Prochaska’s brother, Eddie, died. Even though this event and some of the circumstances inspired the book, Prochaska states, “I filled in the blanks and created the world of the book by following the adage of writing what you know.” He says close friends may find similarities between him and Ethan, but he mostly had fun writing some of the side characters and exploring their specific dynamics. Prochaska does admit that surprisingly, writing the book was healing in unexpected ways. “To have a chance to say goodbye vicariously through Ethan in this novel released something I wasn’t even aware I was still carrying.” Said Prochaska. Prochaska states, “The writing process for this book was different from writing short stories, mostly in the planning process and checking for continuity. I didn’t write from beginning to end, so when it came time to write the scenes in between what I had, it was often difficult to dovetail scenes together.” In all, the writing process took Prochaska 30 months, but that included some time where the story sat idle for a bit. Most of the story was in his mind, but he did make a few trips back to Cedar Rapids to walk and drive around the city to remind himself of the feel and smell of the place. He worried that readers who didn’t personally know Cedar Rapids wouldn’t get the context of it. He tried to portray it in a way that people familiar with the city would understand as well as those who could relate to it. Thanks to the author for sending a copy of this novel for the purpose of this review. This review is my honest opinion. If you choose to purchase this novel through the above link, I may receive a small commission without you having to pay a cent more for your purchase. Thanks for supporting SincerelyStacie.com.